How many cost-saving proposals have each of the Council members brought up so far in the Budget Work Sessions? Which cost-saving proposals have they recommended so far? How much money has each Council member asked to be cut from the City Manager’s proposed budget? Has anyone on the City Council suggested an affordability goal for reducing the budget? Has anyone on the Council suggested a target for reducing taxes or fees in the budget? Has anyone on the Council suggested reducing the huge increase in staff in the City Manager’s proposed budget? Has the Council agreed to use a sliding scale for City Staff pay raises, after City employees received two separate raises this year? Or, do they plan to capitulate and offer all employees 3% raises, including executives with lofty salaries at the top? Have any of the Council members’ proposals for new spending have been offset with corresponding cuts, to ensure a zero impact on each new funding request? Affordability was often listed as the biggest issue in last year’s City Council campaigns. Has the importance of affordability been front and center so far in the budget deliberations? Which Council Members appear to be taking the lead on affordability throughout the budget deliberations? According to a recent article in the Austin Monitor, the City Manager’s budget proposal would RAISE TAXES ALMOST TO THE LEGAL MAXIMUM! That is called the “rollback rate,” which is an 8% increase over the current zero “effective rate.” Specifically, Marc Ott’s proposal would raise the tax rate to 48.14 cents. The legal maximum rollback rate is 48.26 cents. We would see some relief from the new 6% general homestead exemption. But the bad news is that the proposed budget does not include any specific spending cuts to offset the revenue gap from the homestead exemption. In other words, taxes would need to raised to make up that difference! Andra Lim with the Austin American-Statesman wrote a City Hall Blog piece entitled, “5 Things We Learned As Austin Officials Started Hammering Out the Budget.” Unfortunately, three of those five items relate to NEW SPENDING that Council members would like to ADD TO THE BUDGET. While these programs may be worthwhile, and some appear to be, where are the cuts needed to offset these changes? Earlier this week, I was at City Hall for a meeting with a City Council aide. While walking down the hall, I encountered another aide who delivered some disturbing news. He told me about a trend that has emerged during the budget talks. Every time someone brings up a plan to cut some part of the budget, another Council member has a pet project ready to absorb that new-found money. Remember affordability! Remember the map of the City almost totally blanketed with double-digit tax appraisal increases for this year. Most homeowners will face the 10% appraisal cap, and any difference left over above the cap will be pushed into next year. Probably causing yet another back-to-back 10% increase in taxable value. : a feeling of not having the energy or desire that is needed to move, change, etc. 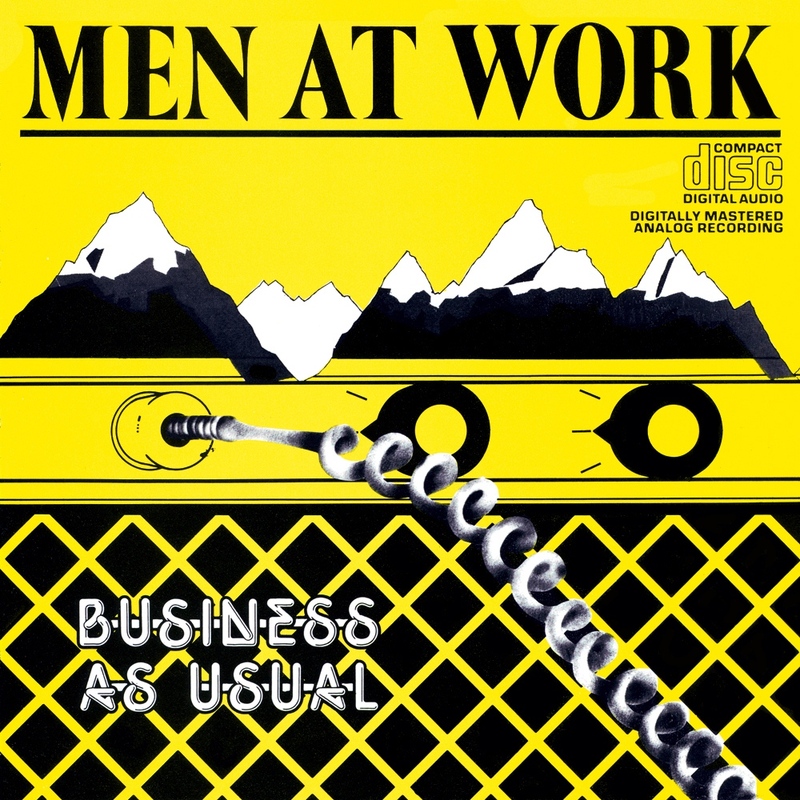 “Business As Usual” was an appropriate title for the groundbreaking album by the Australian rock group, Men at Work, released in 1981. It stayed at number one on the Billboard music chart for 15 weeks and sold 15 million copies worldwide. But here in Austin in 2015, we can no longer afford Business As Usual at City Hall! This entry was posted in General Affordability Updates and tagged Austin, Austin affordability, Austin City Budget, Austin City Council, Austin Taxes on August 13, 2015 by Bill Oakey. On Thursday the Austin City Council voted unanimously to approve a proposal by this blog to produce a Taxpayer Impact Statement as part of the upcoming City Budget. This marks a major step forward for truth in taxation. When the final budget is adopted, taxpayers will be able to determine the actual dollar amount of any tax increase for a range of home values at various levels of appraised value increases. The Taxpayer Impact Statement, which will be included in the budget document and published online, will also include the estimated dollar increases City in utilities and fees. An amendment to the resolution calls for a set of “budget highlights” to be listed on the statement. Many thanks go out to Council Member Elken Troxclair, who sponsored this item as a resolution, and to the co-sponsors, Mayor Steve Adler and Council Members Ann Kitchen and Sheri Gallo. And of course we are extremely grateful to the entire Council for their unanimous approval! On Thursday morning I contacted all five of the Travis County Commissioners and asked if they would consider supporting a similar Taxpayer Impact Statement for their upcoming budget. Commissioner Margaret Gomez was the first to respond, and she has gladly agreed to help. The best-case scenario would be universal adoption by all of our local taxing entities. Once all of their budgets are finalized, we should ask for a combined statement of the impact on taxpayers. I believe that good transparency will lead to a better appreciation of our affordability challenges, and hopefully, an eye toward more prudent budgeting. This entry was posted in General Affordability Updates and tagged Austin, Austin affordability, Austin City Budget, Austin Taxes, Travis County taxes on August 7, 2015 by Bill Oakey. Every year at this time, Austin homeowners grit their teeth and wonder whether the City Council will remember their skyrocketing tax appraisals as they deliberate on the budget. This year the tax appraisals were stunning, with double-digit increases as high as 27 percent in some areas. When the newly formed single-member-district City Council asked the city manager to submit a lean budget with responsible cuts, his response was pitifully weak and it suggested closing a fire station. What part of affordability does he not understand? At the end of July, the city manager issued his official budget recommendation. In Volume One, the word “affordability” appears eight times. But the word “tax” appears 290 times and “fees” 134 times. Property taxes would go up $40 annually for a “typical” median homestead, with the new 6 percent homestead exemption included. But that “typical” homestead is only valued at $232,272. Many longtime residents in single-family homes haven’t seen tax appraisals that low in about 15 years. Even more disturbing is the onslaught of utility increases and “add-on” fee increases averaging $7.98 per month. For most of the past 40 years, these “add-on” fees were included in our property taxes. Here are several ideas for cost savings. Each year with our growing economy, we tend to have budget surpluses. The old city council spent nearly all of those in between budget cycles, with little or no public input. A budget is a budget, and any surplus should be used to reduce taxes, unless there is a public safety emergency. It is long past time for city taxpayers to stop subsidizing for-profit public event companies, like South By Southwest. We could save $4 million every year in the budget with a compromise proposal. City services could be paid from three sources: funds from the Hotel Occupancy Tax, surcharges on ticket sales, and making the event promoters pay some of their own fees. The council should consider awarding staff pay raises on a sliding scale. The city’s recent across-the-board raises, combined with bonuses and other perks, well exceed the stagnant wages of tens of thousands of other Austinites. Another opportunity for substantial cost savings involves the annual transfer of funds from the Budget Stabilization Reserves. Instead of spending more than $20 million on “wish list” items as the previous council did, the new council should time the purchases of new capital items over several years. Some of the surplus could be used to offset the cost of recent flood-related repairs, thereby cutting the budget and saving money for the taxpayers. For better transparency, I have proposed a truth-in-taxation plan that includes a “Taxpayer Impact Statement.” This would be a chart that shows tax appraisal values from $100,000 to $1 million, in $50,000 increments. Categories should include the general and over-65 homestead exemptions. There should be columns showing the dollar amount of taxes due and the increase above last year’s amount. Taxpayers should be able to look across the chart and estimate their tax increase, based on various levels of appraisal increases up to the 10 percent appraisal cap. In my discussions of this proposal with both Austin and Travis County officials, some have suggested that the County Tax Office could help by creating a standard format for all taxing jurisdictions. The city has a flawed policy of cramming the budget process into a few short weeks after the city manager’s recommendation. Travis County begins their budget process in February. The council should consider adopting an earlier schedule for next year. In light of the current tight deadline, they should not accept the city staff’s request to add 347 new positions, compared to only 151 that were added last year. Such a big change should require much more discussion and community input. The tax-supported general fund has grown 38.9 percent in the last five years. Keeping the budget lean will be necessary if the new City Council wishes to achieve their goal of implementing a full 20 percent homestead exemption over the next few years. This first budget is their opportunity to prove that they are ready to quit talking about affordability and show us some real action. Oakey is a retired accountant and writes at AustinAffordability.com. This entry was posted in News & Editorials and tagged Austin, Austin affordability, Austin City Budget, Austin City Council, Austin Taxes on August 5, 2015 by Bill Oakey. On Thursday morning the new City Council members were treated to something they have been eagerly awaiting all summer long – the proposed FY 2016 City Budget. If you would like to get an overview, you can see Volume One right here from the City’s website. It is easy to see from those figures alone that the City intends to spend more money much faster than the growth in new population. Imagine what would happen to the tax impact on long-term residents if that trend continued for the next 10 years. Another disturbing tidbit is that the City Manager proposes adding 347.4 new staff positions, which is more than double the number of 151.25 positions that were added last year. Also, utility and fee increases averaging $7.98 per month are included in the budget. So, What’s the Bottom Line On This Year’s Proposed Tax Increase? 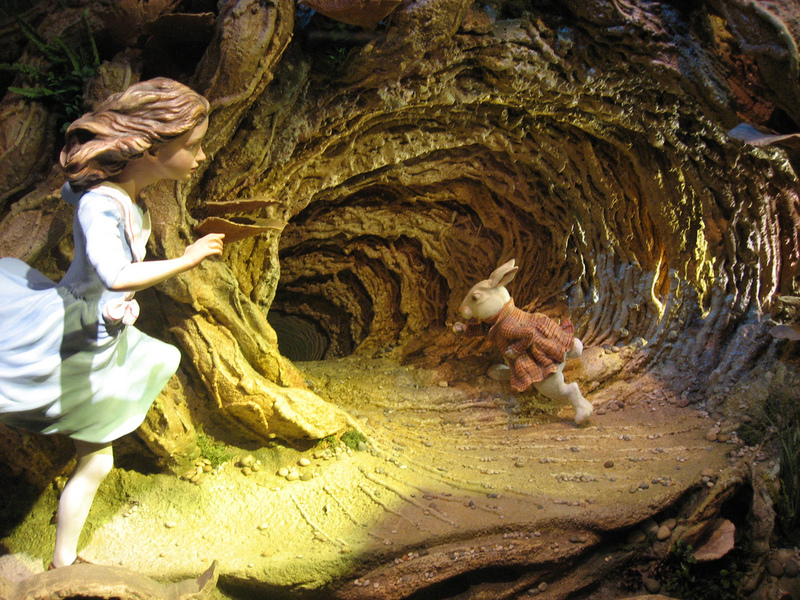 The fairest and most truthful way to answer that question is to look first at the tax appraisal map from TCAD that was published in the spring when the new appraisals went out. Click to enlarge the map. 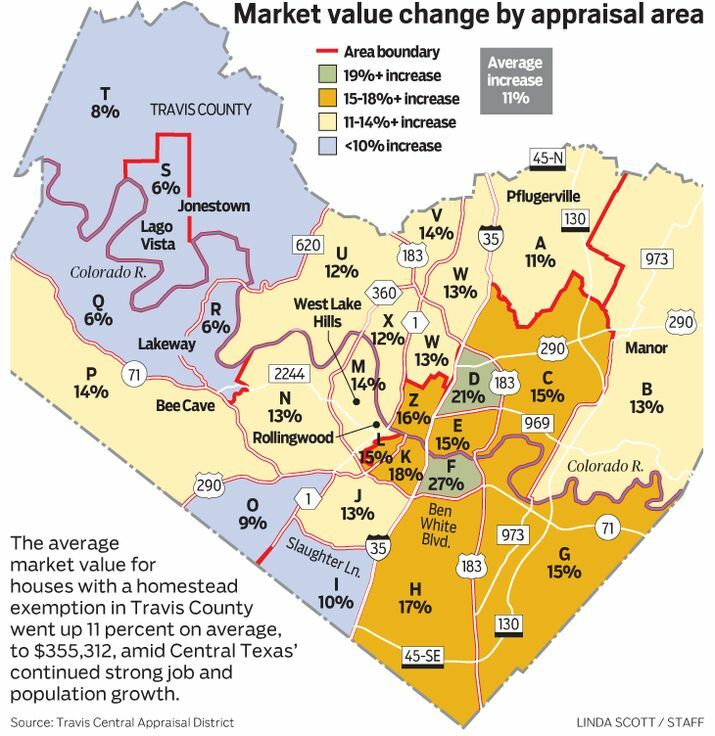 Notice this statement that appears next to the map, “The average market value for houses with a homestead exemption in Travis County went up 11% on average to $355,312.” Because the map includes several areas that are outside the City of Austin, it is hard to tell exactly how much the average appraisal increase is for Austin residents. But we can see that almost every Austin section on the map will, on average, hit the 10% tax appraisal cap. However, the City told the Austin American-Statesman that “The owner of the median-valued homestead worth $232,272 would pay $1,051.08 in city taxes, up from $1,011.24 this past year.” That works out to a very modest-appearing tax increase of only $40. This includes the new 6% homestead exemption approved by the City Council. Here is a comparison between the data in the current FY 2015 Budget (Vol. 1, Page A-16) and the proposed FY 2016 Budget (Vol. 1, Page A-13). But this comparison is not accurate, as you will soon see. It turns out that the data presented in each of these budgets only allows an “apples to oranges” comparison of the numbers. After conferring with the reporter of Thursday’s article in the American-Statesman, I obtained the missing number needed to derive the $40 tax increase for the “median value” homeowner. The “median value” of $232,272 for a home in the FY 2016 budget is actually the “median homestead value.” They used that value because the City has adopted a 6% homestead exemption. So, in order to calculate the tax increase, we need to know the “median homestead value” for FY 2015. That number, which does not appear in either of the budgets, happens to be $210,279. Thanks to Andra Lim with the Statesman for tracking it down from the City. The median homestead value only includes owner-occupied homes, and not the ones being rented. So, there is a vast difference in the variety of residential properties on the tax rolls. A $40 annual tax increase looks small, but the median value numbers above include small units in multi-family properties such as condos. The biggest tax burden is borne by single-family homeowners, who make up a large percentage of Austin’s long-term residents. We have been told that the City Manager’s budget proposal calls for a tax rate increase from 48.09 cents to 48.14 cents per $100 valuation. But that doesn’t tell us the percentage increase above the “effective rate,” which would take the appraisal increases into consideration. 1. A column showing last year’s taxable values, with no homestead exemption, plus columns showing the standard homestead exemption and the over-65 and disabled homestead exemption. 2. Additional columns showing this year’s taxable values at various appraisal levels, up to the 10% cap. And the dollar amount of taxes due at each appraisal level. 3. Columns showing the average amounts of utility and fee increases. 4. A final column showing the estimated grand total of tax, utility and fee increases. It is time for the City to finally bring the full, complete and truthful impact of the budget out of the shadows and into the open! When asked to rate “Overall value for city tax dollars and fees,” 40% of citizens responded that they were satisfied or very satisfied, four percentage points better than the national average. However, 30% of respondents expressed dissatisfaction. Satisfaction is down nine percentage points from previous years, indicating that residents and business owners may increasingly be feeling the pinch of higher tax and utility bills. This entry was posted in General Affordability Updates and tagged Austin, Austin affordability, Austin City Budget, Austin City Council, Austin Taxes on July 31, 2015 by Bill Oakey. 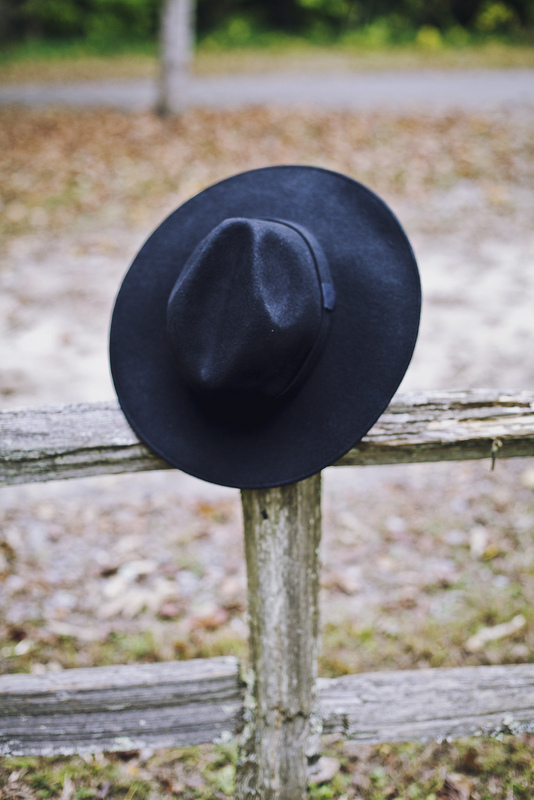 In the City of Austin, the name Don Zimmerman means different things to different people. Whenever I bring up the name, I get a variety of strange looks and interesting expressions. I suppose there could easily be more than one Don Zimmerman here, since Austin has become a pretty big city. The Don that I know best currently represents District 6 on the Austin City Council. Before he was elected last November, he earned a reputation as a fighter for the taxpayers, even occasionally taking his battles to court. But to put it mildly, Don Zimmerman was not impressed. The first thing he showed me came as no surprise, but it ticked me off nonetheless. Get ready for this everybody…we should have known it was coming. 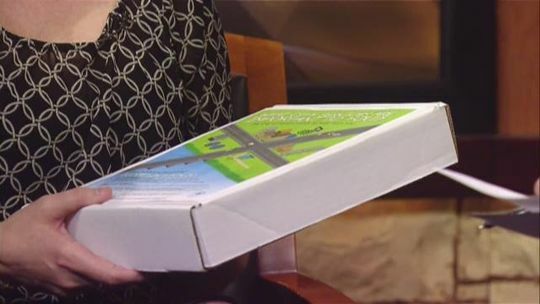 The wonderful news from the Budget In a Box is that the City is forecasting a slight decrease in the property tax rate! Yes, once again we are not being told the Truth-In-Taxation percentage of the estimated tax increase. That is why the first item on my reform list has always been Truth In Taxation. Because of the high property tax appraisals this year, the tax rate could go down slightly and we would still see a pretty stiff tax increase, especially those people whose appraisals have hit the 10% cap. The truthful amount of the City’s tax increase would be stated as the increase above the “effective rate.” That is the amount that would generate the same amount of revenue as the City received last year. By law, they can raise the effective tax rate by as much as 8% without triggering a rollback election by citizen petition. Last year’s tax rate changed by only a fraction of a penny, but the increase above the effective rate was 3.8%. Meanwhile, back in Don Zimmerman’s office, we looked at the chart on Page 57 of the Five Year Financial Forecast. I will not attach an audio recording of the words that may have slipped out when we saw the huge chart of tax, utility and utility add-on fee increases. You can read it yourself right here. For a “median-value home” of $221,086 the bottom line projected increase is $18.53 per month. The tax portion of that is only $7.05. But here’s the problem. The estimated tax amount does not include any new programs or changes made by the staff or the City Council. And the chart does not take into consideration whether your home saw a double digit tax appraisal increase. So, the tax increase that you would actually see on your bill would most likely be considerably higher. And, by the way, how many people do you know who live in a “median-value home” that is appraised that low? To summarize my meeting with Mr. Zimmerman, he told me that he supports my affordability proposals. And he mentioned one of his own that I will explain in detail in another posting. We all have a big hill to climb between now and the end of the budget season. It will not be a stroll on the beach, like the Beach Boys portrayed in their 1974 album, Endless Summer. As for Don Zimmerman, some of you may have him confused with that other guy out there that some people think is “way out there.” The one that brings to mind flying saucers, conspiracy theories, and tables levitating to the sound of voices from the dead. That is not the Don Zimmerman that I talked to down at City Hall. But, I don’t want you to leave this blog disappointed if you came here looking for a pathway to adventures from another world. Just grab a beer or a glass of something else and check out this video. This entry was posted in General Affordability Updates and tagged Austin, Austin affordability, Austin budget in a box, Austin City Budget, Austin City Council, Austin Taxes, Don Zimmerman on June 6, 2015 by Bill Oakey. A long tall Texan got into his pickup truck and switched on the radio. He listened to the following commentary from a country music deejay down in Austin. Now folks, I don’t get into politics on this show, but I heard about something the City Council said that I think you should know about. They were talking about an unlevel playing field for property taxes. Something about the system that isn’t quite right. Maybe they have a point. Have you ever sat down in a Texas dance hall and tried to hold onto a beer when the table wasn’t level? Worse case scenario, you would spill some of that beer on your best friend’s wife, right after you danced to “The Last Cheater’s Waltz.” I think we need the City to level our taxes. I have a nutty friend who spends a lot of time reading City financial reports. Darned if he didn’t tell me that the City Manager is promising once again to “hold the line on the tax rate.” Man, they’ve been pulling the wool over our eyes every year on that stuff. Willie Nelson, Norah Jones and Wynton Marsalis nailed it with the song, “Here We Go Again.” Isn’t there supposed to be some kind of truth in taxation? The high taxes have priced people so far out into the suburbs that it’s a wonder more of them don’t fall Asleep at the Wheel while sitting in traffic. I can see why the character in George Strait’s song, “All My Ex’s Live in Texas” now hangs his hat in Tennessee. He couldn’t afford his Austin taxes. And it keeps getting worse. The end of year tax deadline is not a whole lot of fun. In 1974, Merle Haggard released a sad but hopeful tune called, “If We Make It Through December.” He must have known what was coming down the pike in Austin. This entry was posted in Humor and tagged Austim music, Austin, Austin affordability, Austin City Council, Austin country music, Austin Property Taxes, Austin Taxes, Texas country music on May 29, 2015 by Bill Oakey.